I think we can all agree that we are glad the election is almost over. While this has been one crazy campaign, both candidates have been making a spectacle of themselves in one way or another. Tonight, however, the Orlando Eye is going to make one giant spectacle of the election. It will be the latest in a series of events that has been happening at I-Drive 360 at all three of the Merlin run attractions. Over at Madame Tussaud's Orlando, Katy Perry has been urging visitors to rock the vote with a very special outfit. Poll curtains! The museum known best for its celebrity wax figures has dressed Katy Perry in a pair of Poll booth curtains…and nothing else! It's a reminder that there is no dress code for the election! READ MORE: How Will 2016 Election Result Impact Americans' Travel Plans? We do believe, however, that most of us couldn't get away with wearing curtains to the polls. Madame Tussaud's is the only place that you can see it, along with dozens of other figures of your favorite celebrities. 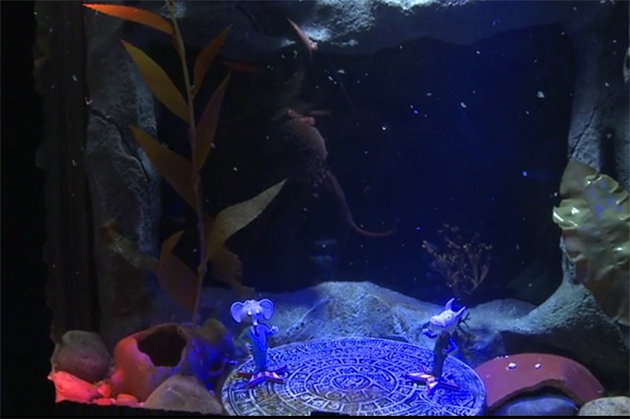 Over at Sea Life Orlando, the aquarium team put the skills of the highly intelligent giant Pacific Octopus to the test. When given a choice, which candidate would it choose? Octopuses have extremely advanced problem-solving skills, most due to their nine brains. So a creature of this high level of intellect could pick the best candidate with confidence, right? Well, when given the choice the Giant Pacific Octopus couldn't make a choice and decided instead to go after some lunch. Pretty smart, seeing that most of us feel the same way about this election. The big spectacle will come tonight, beginning at 8 p.m. EST when the Orlando Eye will begin keeping track of the election results. The Orlando Eye is 400 feet tall and uses thousands of LED lights to light up the structure. It is capable of many different light combinations. The Eye has been lit for many different occasions, including for huge celebrations and tragedies all over the world. Back in June the Eye was lit in rainbow colors in support of the Pulse Nightclub tragedy. During holidays The Eye gets lit for the occasion. 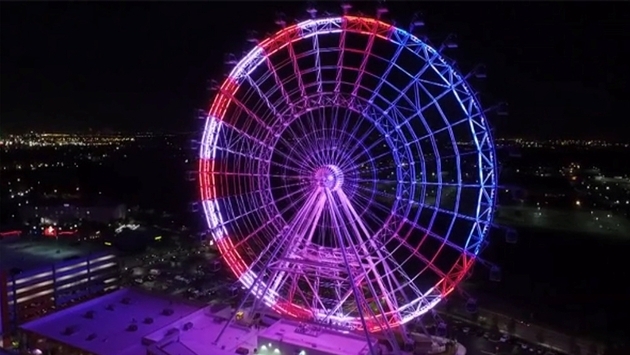 It has fast become an Orlando tradition to see the brilliant colors of The Eye, either while driving by or enjoying the night at I-Drive 360. Tonight that tradition continues, as the Orlando Eye will keep track of election results by becoming a massive pie chart! Every 30 minutes the election results will be updated and guests near the Eye will be able to see who is winning. Red will signify Donald Trump and Blue will signify Hillary Clinton. The results will be able to be viewed from all over Orlando, and will be shared online. Which color will overtake the Orlando Eye? That choice is yours! Get out and vote before the polls close!